At Goshen College’s Kick-Off, amidst a lineup that included Barnett’s Boys launching themselves in the air, the Great Hughdini reading minds and an electrifying performance of Wheatus’s “Teenage Dirtbag,” was the official launch of a social media app that aspires to compete with social media’s best. During intermission, a short video advertisement played that showcased the application as well as some of its features, marking Blink’s official launch. “It looked interesting, but I wasn’t sure what was going on,” said Reed Yoder, a junior at Goshen College. 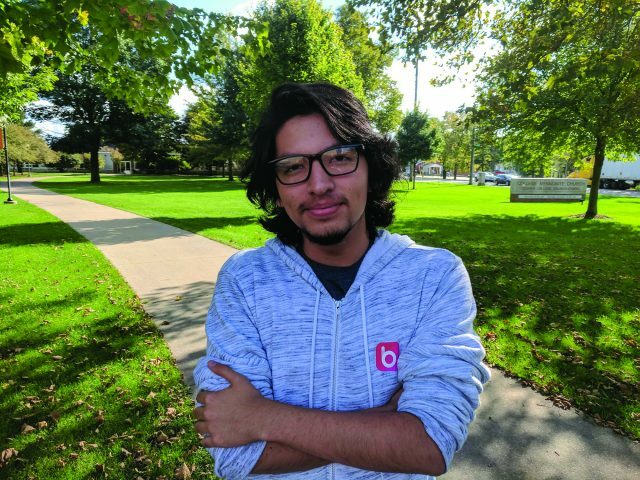 What not all Kick-Off attendees might know is that Blink is the product of five passionate developers, the youngest of which is Goshen College’s own Mikol Aspinwall. Aspinwall is a senior computer science major at GC, and while he’s been involved in everything from managing Mennonite.net, a nonprofit hosting service for over 100 websites, to internships at tech companies in California, he says he’s never been part of something quite like Blink. The project has been in development for two years and is headquartered in Silicon Valley. Seven months ago—in March—Aspinwall found out about Blink from a friend and signed up to be a tester. “I got involved with Blink during a user experience study. I did some market research, and I did my best to offer advice,” Aspinwall said. He ended up liking the app so much, he asked Sam Mueller, Blink’s CEO, for a job with the company. Three months after learning about Blink, Aspinwall had become Blink’s fifth developer. Aspinwall sees no reason the app wouldn’t be able to take on the likes of Snapchat and Instagram. But why would an app aiming to be the next big thing in social media start out in Goshen, Indiana? “Blink is a video messenger that specializes in making your messaging fun,” said Aspinwall. As of now, Blink is only available for IOS users, but Aspinwall said that Blink’s developers will be looking for ways to make the app accessible to more people. The core of Blink’s experience is its unique camera. The camera, along with filters similar to Snapchat’s, uses what Aspinwall refers to as voice filters. After pulling out his phone, Aspinwall says into the camera that he’s going to “the Rott” — a nickname for Westlawn Dining Hall. Upon saying the word, a picture of a sunny-side-up egg pops up on screen, alongside text saying “the Rott.” Unlike regular filters, Blink’s voice filters automatically appear for a few seconds on-screen when the user says a word that triggers one of the filters. In addition to voice filters, Blink makes use of statuses, a Snapchat-esque story that is created when someone posts a Blink video. Once someone has posted a status, anyone can add onto the status with their own videos or by joining in on a group chat that is automatically created for anyone who tags themselves on the status. Adolfo Sigala Flores, a sophomore at GC, says that he’s been surprised at the amount of fun he’s had with the app. Before Blink, Flores said that his friend group had used a bunch of different social media applications to communicate. Since its launch, Flores’s friends have begun using Blink as their primary means of communication. “It’s more interesting [than other apps] with the video effects, and it’s more fun,” said Flores. Despite his enthusiasm, Flores admits that he wasn’t immediately sold on the app. “I thought it was going to be a more complicated Snapchat, but it was actually pretty simple,” he said. Flores encourages skeptical students to give it a shot. Aspinwall described a time when his friend group “Blinked” each other dances from the popular PC game Fortnite. “Another time, we all started shouting things out at the same time and random things would pop up on the screen because of the voice filters,” he said. Aspinwall went on to say it would be awesome to look back at Blink once it has taken off, remembering its start in Goshen, Indiana.